Providence’s signature art festival will return for its third edition June 1-4, 2017. Musicians, artists, vendors and creative minds of all kinds are invited to connect with festival staff to express their interest in performing, creating, selling and volunteering at PVDFest 2017. 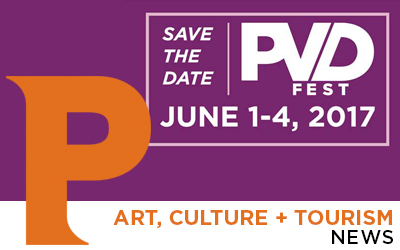 Providence, RI – City of Providence Mayor Jorge O. Elorza, the Department of Art, Culture + Tourism and founding creative partner FirstWorks announced PVDFest, Providence’s signature art festival will return for its third edition June 1-4, 2017. PVDFest will once again transform streets in the heart of Providence into a celebration of art, music, food, performance and more. Artists and performers from around the block and around the globe will converge in Providence for an outdoor event expected to draw thousands of guests. Building upon the success and energy of the past two festivals, PVDFest will continue to connect the vibrant neighborhoods of Providence with artistic talent from throughout the world. The four days of citywide programming will once again culminate on Saturday, June 3, beginning with a celebration that will turn spaces downtown into a world-class performance stage, cutting edge art gallery, and culturally diverse block party. Further details about programming and line-up will be announced closer to the festival date. “True to our mission to connect art with audiences, we’re thrilled to continue to foster local artistic collaborations and to bring dazzling performing artists from across the globe to delight our ever-expanding audience at this signature festival in the heart of Providence,” said Kathleen Pletcher, Founder and Executive Artistic Director of FirstWorks. In addition to the dates for next year’s festival, Mayor Elorza announced the launch of the community portal available at www.pvdfest.com. This portal is a place for musicians, artists, vendors and creative minds of all kinds to connect with festival staff to express their interest in performing, creating, and selling at PVDFest next year.